Dubai Summer Surprises (DSS), the annual citywide summer celebration in the city, will return to the city from June 22 to August 4, 2018, offering a six-week extravaganza of sales, retail experiences and events. Organised by the Dubai Festivals and Retail Establishment (DFRE), an agency of the Department of Tourism and Commerce Marketing (Dubai Tourism), the 21st edition of the popular summer event will feature a sizzling line-up of spectacular sales, retail experiences, unmissable chances to win and weekly performances to keep the whole family entertained this summer. Ahmed Al Khaja, CEO, Dubai Festivals and Retail Establishment (DFRE), an agency of Dubai Tourism, said: “Dubai Summer Surprises is one of the most popular events of the Retail Calendar and we are excited to announce this year’s dates. Highlights of this year’s Dubai Summer Surprises include a mega Opening Day 12 Hour Sale, a daily Deal of the Day (DOTD) offer, weekly Weekend Destination surprises and the Final Weekend Sale. Dubai Summer Surprises will kick off in style with a seismic six weeks of sales, giving customers 25% to 75% off throughout the six-week DSS period. Top name global brands will be offering knockout discounts, giving customers the chance to get their hands on belting bargains across Dubai’s malls and shopping areas over the summer. DSS will kick start with a mega 12-hour sale on opening day (22 June). 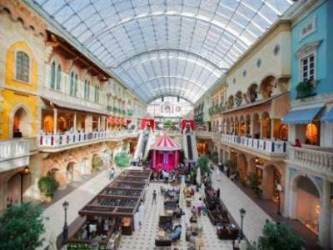 Participating retail outlets at Majid Al Futtaim malls in Dubai will offer incredible discounts from 25% to 90%, giving shoppers a 12-hour bargain bonanza. The sale will run from 12pm to 12am on 22 June, featuring big discounts, exclusive offers and surprises. Deal of the Day (DOTD) will offer people an incredible shopping deal every day throughout DSS, starting on the 23 June and finishing on the 1 August. Creating serious FOMO (fear of missing out) across the city, the deals will only be revealed 24 hours beforehand so savvy shoppers are urged to monitor the DSS website and social channels to avoid disappointment. The Weekend Destination initiative will see a different mall every week offering full weekend of additional surprises and entertainment. Taking place at a different shopping area each week, people will get the chance to shop til’ they drop with extended opening hours (2am every Friday) at the participating Weekend Destination mall. To crown six glorious weeks of sales and promotions, DSS will culminate in a Final Weekend Sale, commencing on 2 August and finishing on 4 August. The Final Weekend Sale will feature the very last price cuts of summer, giving shoppers a final opportunity to snap up the best discounts, before the sales period is over. In addition to super sales, there will be plenty to keep residents and tourists excited all summer long with citywide attractions at some of Dubai’s top theme parks, concerts from local and global music icons and the return of everyone’s favourite character, Modhesh. Those looking to get in on the action early, can purchase a Dubai Pass now giving people up to 60 per cent discount on over 30 attractions across Dubai. Head east for a touch of Bollywood glamour at Bollywood World or channel your inner superhero at IMG Worlds of Adventure, all for less than the regular price this summer. Available to purchase from Dh399 for a standard package, Dubai Pass offers unbeatable savings on the very best of Dubai’s must-visit destinations this summer. DSS is supported by strategic partners which include; Emirates Airlines, The Dubai Mall, Majid Al Futtaim Properties, AW Rostamani Group, Al Futtaim Group (Dubai Festival City), Nakheel Malls (Ibn Battuta Mall, Dragon Mart 1, Dragon Mart 2), Dubai Duty Free, ENOC, Al Zarooni Group (Mercato), Meraas and Etisalat. The full calendar of events will be announced ahead of the festival so people are encouraged to check the website www.dubaisummersurprises.com or follow @DSSsocial for the latest information. Dubai Summer Surprises is part of Dubai’s annual Retail Calendar that features major retail-based festivals, new season launches, mega sales and exclusive retail experiences and attractions aimed at further enhancing the retail sector, a main contributor towards Dubai’s economy.